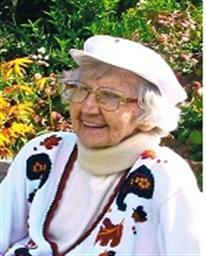 (December 27, 1921 - February 6, 2013) Winnifred "Winnie" Schmidt (nee Berry) died peacefully at Gateway Haven Nursing Home in Wiarton. She looked forward to her conversation with Jesus in person. She is survived by her eldest son Rev. Ralph (Sharon) Schmidt; daughter Jane Martin; daughter-in-law Doris Schmidt; grandchildren Melanie, Lauren, Nicole, Tammy, Stephanie, Robert and Krista; as well as six great- grandchildren. She was predeceased by her husband of 64 years, Harold; son Bruce; grandsons Trevor and David; brother Roy (wife Veronica); brother-in-law Ralph; and her parents John and Clara (nee Eichler) Berry. Cremation has taken place, with interment in Memory Garden, Guelph at a later date. A memorial service will be held at Gateway Haven Nursing Home, Frank St. in Wiarton at 11 am on Monday February 11th, 2013 with visitation one hour before service. Rev. Brad Mittleholtz will officiate. In lieu of flowers memorial donations may be made to Bruce Peninsula Hospice Inc., or St. Peter's Lutheran Church in Wiarton. Funeral plans arranged at the Thomas C. Whitcroft Peninsula Chapel, 272 Berford St., Wiarton (519) 534-5341.